Connector unit offers a durable mahogany laminate and ways for guests to easily power their mobile lifestyle with a power outlet, Wi-Fi plug and two USB ports near the center for easy access from all directions. Plug in and keep surfing, playing games, answering urgent emails and more. 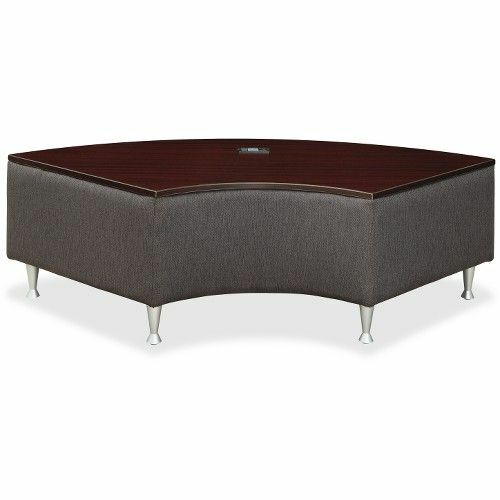 Four brushed aluminum legs offer reliable support. Design also includes upholstered side that match the rest of Lorell's Fuze Modular Lounge Series for seamless integration. This connector unit fits into multiple configurations that are ideal for impromptu collaboration, reception and lounge areas. Other series components (sold separately) include square lounge chairs with power outlets, end lounge chairs (left and right) with power outlets, armless lounge chairs and a bench.